One of the neat things about keeping a detailed log of your expenses is that you can easily go back and identify the bonehead moves (and do your best not to repeat them). If you don’t already use something like Microsoft Money or Quicken to track your finances, I really suggest picking one or the other up and then trying to get into the habit of actually using them — it will save you a lot of money when you start to visualize where your money is actually being spent. So, without any more filler, and just to get things started, I’ll venture back into the records and start way back in January 2007. 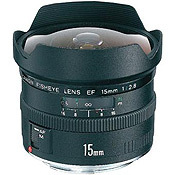 The dumbest purchase of January 2007 was a Canon EF 15mm f/2.8 Fisheye Camera Lens. A fisheye lens is basically a super wide angle lens. You know those greeting cards with the dogs on them? The kind where the dog’s nose is huge and it looks like their snout is really long? That’s the effect of a fisheye lens. For a photographer, it’s strictly a specialty lens. You know, something you don’t *really* need, but still something that’s nice to have in your arsenal. It’s a great way to make your photos stand out from the rest, but you need to use it sparingly because the distortion can get really cheezy if overused. About a year earlier, another photographer let me borrow his fisheye while we were shooting a concert. Having had no experience with that type of lens, my photos were terrible, but I saw the potential that it had. I scoured the reputable used photo listings for months with no luck. That’s the thing — even though the fisheye isn’t used very often, it really is nice to have one, so very few are selling on the secondary market, at least at a fair price. In the midst of hockey season, and the hopes of getting a goal cam set-up, I finally ordered one online from B+H Photo in New York City. Including shipping, it set me back $596.50. Yep, 600 clams for something I’d rarely find use for. Nearly a year and half later, I’d say I’ve shot maybe 100 frames with that lens. That may sound like a lot, but during the hockey season, we’d shoot a minimum of 2000 total frames per week. Basically, the fisheye isn’t a workhorse. And it’s a secondary lens — it was very rare that I’d actually use it. Only one fisheye shot has been a “keeper”. Just one — a panoramic arena shot. Hardly exciting. That was my dumbest purchase (and largest too!) of January 2007.